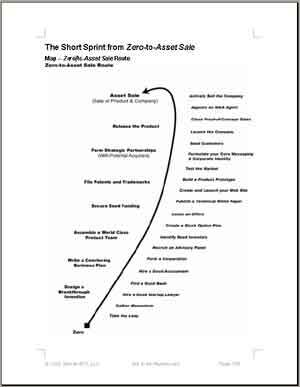 The short sprint from Zero-to-Asset Sale is a completely different route from Zero-to-IPO that involves building a company to sell from the ground up with the focus on building up assets and packaging them in a way that best appeals to a potential acquirer. "Would you buy an unprofitable business that was consistently burning up cash, bearing in mind that after the acquisition, the cash that was burning was the cash in your pocket? Whether or not you wear fire-proof pants, this does not sound like a very appealing proposition. However, in the technology sector, it is possible to sell a company that’s unprofitable and cash-flow negative. In fact, it happens all the time. Imagine you own a national chain of pet stores with millions of regular customers. You discover that a revolutionary new recipe for dog food has been invented (probably in that secret underground laboratory beneath Sand Hill Road, Menlo Park). Evidence shows that dogs relish the taste of this particular recipe and wolf it down it with gusto. It also has miraculous properties -- just one meal will cure any canine illness, restore dogs to the prime of health and make the pets more loving and friendly towards their owners. You figure that every dog owner in the world would want this particular brand of food! Of course, this product would sell well on the shelves of your stores, however if you could acquire it on an exclusive basis, you’d attract customers from your competitors stores as well – they’d have to come to you as you wouldn’t make it available elsewhere. If you could buy exclusive rights to this product, you figure you could double the size of your business in 6 months, deliver humongous profits and your share price would go through the roof. You need this product! However your competitor, and deadly enemy, is also hankering to buy it. The recipe is protected by patents, trademarks and all forms of protection – it’s definitely only one of a kind. Depending on how much you bid, either you, or your competitor, will get to win the prize and buy this product on an exclusive basis – it’s a winner-takes-all scenario. The recipe was developed by a team of 10 nutrition scientists and belongs to a small company that they formed for this purpose. Although it’s been thoroughly tested, the product has not yet been commercialized and the business is burning up cash at the rate of $250,000/month. Does this sound like an appealing acquisition? How much would you pay? Clearly, this product is of strategic importance to your company. If you buy it, you get to dominate your market and expand your business. If you don’t, you’ll lose your customers to your competitor and you’ll struggle to compete. Of course, the $250,000 per month cash burn is not too appealing, but this should not prevent you from buying this company. There’s much more at stake than a $250,000/month burn rate. 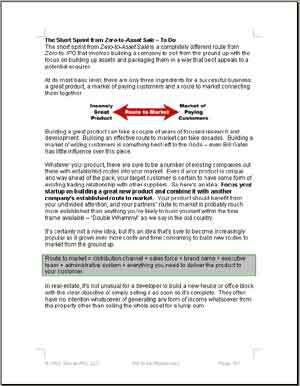 Combining this new product with your routes to market would boost your business and, in the long run, could be worth billions of dollars in sales and profits. You’d be crazy not to pay a good price for this company, put its development team on your payroll with non-compete employment contracts and get to own the winning recipe outright. In many ways, the dog food inventors have been very smart. Instead of taking on the cost and responsibility of building their own chain of stores, they focused all their attention on building the product. This meant that they could avoid having to hire a large team, keep costs under control and steer clear of raising multiple rounds of funding. After creating the product, all they need to do is prove that the dogs like the dog food, protect the recipe from infringers and shop the product, and company, to a list of existing players with established routes to market." The philosophy you need to follow to target selling the company from the outset. Detailed milestones and stepping stones that make up the route. Assembling a short sprint team. Structuring the company to make it an appealing acquisition target. Reducing the cost and risk involved in building a valuable startup company. How this route has the potential to offer a lower cost, lower risk and quicker return for investors. Contingency plans – what can go wrong on this route and how you can respond.